The Manzanita Street Community Garden in Los Angeles, CA. Photo courtesy of the Los Angeles Community Garden Council. In a city of concrete that seems to extend forever, where every vacant lot looks destined for development, a patch of green is a welcome sight. Julie Beals, executive director of the Los Angeles Community Garden Council (LACGC) describes the response of residents of an East Hollywood neighborhood when they heard of plans for a community garden. “I had an older man break down in tears when I told him because they just expect the empty lot to be turned into a big apartment building.” She adds that in really dense neighborhoods people are thrilled when they find out they’re getting a community garden. The LACGC manages 40 community gardens with negotiations underway for another three. All, except one, are traditional community gardens in which gardeners lease individual plots for a small monthly fee of about five dollars. “We keep it as low as possible to make it as accessible to everybody,” says Julie emphasizing that accessibility is key, which is why they don’t focus on school or hospital gardens or any restricted access gardens. In fact, their Crenshaw garden with about 36 plots has more than 120 people on their waitlist, which is run on a first come, first served basis. Lease agreements for plots in new gardens are for a maximum of three years. “This way we’re able to rotate more people off the waitlist and get more people gardening.” Julie explains that the new gardens are outfitted with larger communal areas so that when people don’t have a plot, they can still help out with gardening. The LACGC helps each community garden establish a volunteer leadership team that oversees the day to day management of the garden while the organization takes care of the business side. Collected dues are submitted to the LACGC, and the organization also manages insurance and annual taxes, and negotiates land leases. The 501 (3) c non-profit relies on public donations as well as grants they receive from foundations and corporations. They’ve received only a little bit of government money for a couple of their gardens. Typically dues collected from their gardeners cover the costs of water and basic garden improvements, but any major improvements requires applying for a grant for that project. Community gardens bring many benefits to a neighborhood. “First of all you see crime reduction,” says Julie. 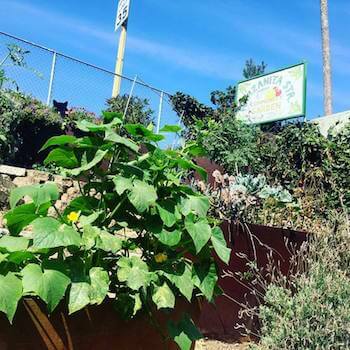 The Glassell Park community garden is a classic example. Formerly the site of a drug house, it was raided by police and then donated to the city on the condition that it become a community garden. The garden that the LACGC built both improved the look of the neighborhood and made it safer. There are health benefits too, with improvements seen in the BMI and blood pressure of people using the garden. People eat more fruit and vegetables and tend to lose weight because they’re getting exercise through gardening. The LACGC has also provided nutrition classes. In addition, it seems that property values tend go up when community gardens are introduced. One of the major challenges, however, has been the drought that has sent water rates skyrocketing. As a result, the LACGC has taught over 70 water conservation classes in the last three years, focusing on better watering techniques and basic garden rules, like fixing leaking hoses as quickly as possible. They’ve also tried to create awareness that conserving water is not just about cutting water bills, but about environmental sustainability as well. Still these measures may not be enough. With the LADWP increasing water rates by 289 percent over the next five years, Julie says that they may have to close down some of their bigger gardens in the low income neighborhoods because people won’t be able to afford to water them. This is why at the moment she’s working hard to get foundation grants to mitigate that cost and keep the gardens alive.